SCIENCE-FICTION editors are a queer breed of people. 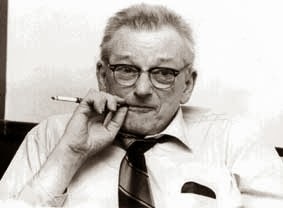 They could originally have been editors of the swellest slicks in the publishing field (and some of them were) but let one of them edit a science-fiction magazine, and thereafter he calls himself nothing but a science-fiction editor and fan. The other magazines he edited no longer count. All he'll talk about is the scientifiction magazine he's editing or has edited. With no exception, they're all like that. It all began in 1926, when the "papa" of the pulp scientification magazines, Hugo Gernsback, decided to put out a magazine devoted exclusively to science-fiction stories. He had been publishing science-fiction in all his magazines for years.- About the best of these were the stf serials in his Science and Adventure, a magazine similar to Popular Science of today. He had even tried an all "Science-Fiction" edition of that magazine with great success. Hugo Gernsback has been a science-fiction fan from his early childhood; he coined the term "science-fiction" to describe his favorite brand of scientific literature. In fact he also coined the word "'scientifiction" from which we get the abbreviation "STF". 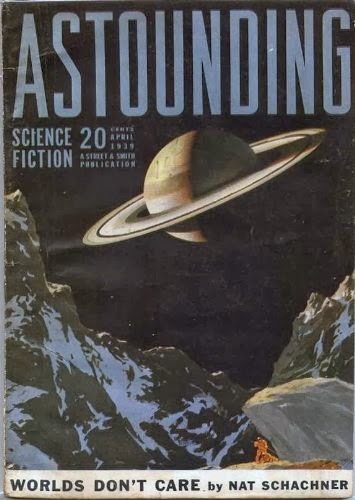 His first all-stf magazine was to have been called Scientifiction, but afraid that it would scare away readers who would misunderstand what it contained, the name Amazing Stories was finally decided on and Amazing Stores it was, the first in the field. Hugo Gernsback left Amazing Stories in 1929 and soon after started another quartette of stf magazines. This time he called them, Science Wonder Stories, Air Wonder Stories (which combined a year later into Wonder Stories and is still being published today as Thrilling Wonder Stories), Scientific Dectective and Wonder Stories Quarterly. 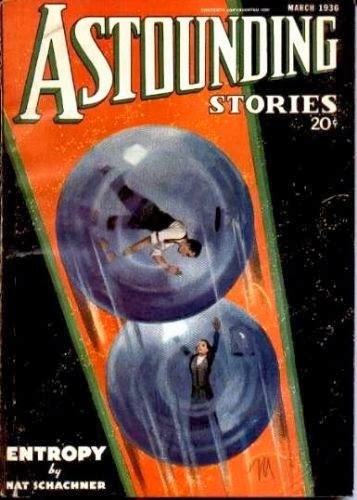 He edited and published Wonder Stories until 1936 when he sold it to Standard Magazines, Inc. Thus, Hugo Gernsback is not only the father of the science-fiction magazine, but the god-father of science-fiction fandom as well. Many volumes could be Written about Hugo Gernsback, the man, but it would be best to let his good friend, the popular author, Dr. David H. Keller, who knew Gernsback personally' when he was at the height of his stf publishing, tell you about him. 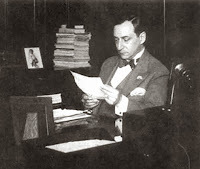 Writing on Gernsback in the tooth issue of Fantasy-Times, Keller stated: "When I first met Gernsback in New York he impressed me as a polished cosmopolitan rather than the usual chauvanistic American. Tall, brunette, energetic, he seemed, in spite of quiet mannerisms, to have a boundless reservoir of energy to be used in editorial or financial emergencies. He always took home with him a brief case filled with manuscripts which 'he read in bed between the hours of 11 P.M. and 2 A.M. He rarely allowed social engagements to interfere with his editorial work. He was a genial host; in his moments of relaxation told interesting tales of his boyhood in Europe. At the age of 14 he wired a convent in Luxemburg, his home city, so that the Mother Superior could ring for her subordinates when she desired their presence. This convent was closed to men and it was necessary to secure Papal Dispensation to enter and install the electrical, system." Gernsback has only attended one meeting of any science fiction fan club in the world. His one appearance was at the March 1950 meeting of "The Eastern Science Fiction Association." Here he stated that he gave up science-fiction publishing because he could' no longer get the kind of stories he wanted. He admitted that he knew nearly nothing of modern stf, and confessed that he hardly recognized it as the same species of story. Gernsback is now in his mid-sixties and is still an editor and publisher. He publishes Radio-Electronics, the leader in its field. Last year his famous book "Ralph 124C41 plus", was reissued, and this year it will appear in England as a pocket book. 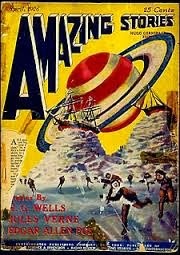 Under Gernsback, as managing editor, was Dr. T. O'Conor Sloane, Ph.D., who stayed on with the magazine Amazing Stories, after Gems-back left it in 1929 and later became full editor until the magazine was sold to Ziff-Davis in 1938. Dr. Sloane was a picture of the ideal scientist. Tall, slim and with a long white beard, he looked the part fans associated with stf editors. He also has the honor of being the oldest man ever to edit a 'stf magazine. Born on November 24, 1851, he was 87 when he left Amazing. He passed away in the early 1940s, having reached the age of go plus. Although he accepted and published many excellent interplanetary stories, he was .of the opinion that man would never conquer space and would never reach the moon. In fact it was only a few years later that both competitors were sold. Wonder in 1936 and Amazing in 1938. Tremaine became editorial director in 1937 and appointed the popular author John Campbell, Jr., to the position of editor for Astounding, a position he still holds today. Tremaine soon left Street & Smith and has since done numerous editorial and publishing assignments. He had his own book publishing company for awhile and has since been editor of numerous magazines. He is an author in his own right with numerous stf and detective stories under his belt. He proved he was still a good stf editor, by publishing the stf magazine Comet, in the early 1940s. Though it published only five issues and was greatly handicapped by a company that could only pay the lowest of rates and employed a poor quality printer, Comet came close to becoming the king of the then published stf magazines before the company went bankrupt and the magazine folded. Had he had a better company to publish it, Tremaine would have made Comet the leading stf mag. Tall and slim, Tremaine has always been interested in stf fandom, attended numerous club meetings and conventions. Today he is an active member of "The Fantasy Veterans Association" (having served in the US Army in World War I) and is presently book editor of the magazine Check. 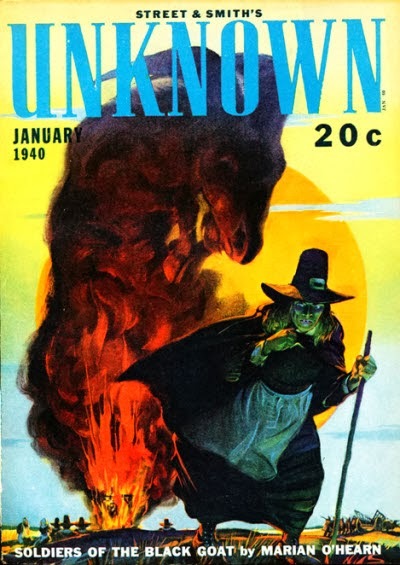 annual From Unknown Worlds was published. To his credit it can be said that Campbell kept Astounding published monthly through the last war, the only stf mag to do so, and has kept the stories in the magazine on top level all through the years. Some fans greatly resent Campbell's dragging Hubbard's dianetics into Astounding. They feel that it has no place in a stf magazine. Currently, besides editing Astounding, Campbell is putting together an anthology of stories from his magazine to be published by Simon and Schuster early in 1952. In the next installment, the Standard magazines, Thrilling Wonder Stories and Startling Stories, and their editors, Mort Weisinger. Julius Schwartz, Sam Merwin Jr., Sam Mines and Jerome Bixby.